Among the dignitaries who attended the event were religious leaders, including Primate Archbishop Shahan Sarkisian, president of the Armenian Evangelical community in Syria Rev. Haroutune Selimian, and representative of the Catholic Armenian community of Syria Father Gomidas Dadaghlian; Armenia’s Consul General in Aleppo Tigran Gevorgian; representatives of various Aleppo-Armenian organizations; and several guests. Before the start of the event, a moment of silence was observed to honor the memory of all those who have fallen in the name of the Armenian Cause, as well as all those who have perished during the Syrian Civil War. The National Anthems of Syria and Armenia then officially opened the event. Welcoming remarks were then delivered in Armenian and Arabic by Houry Derderian and Ara Mutafian respectively. The Hamazkayin Zvartnots choir of Aleppo then performed a medley of Armenian patriotic songs, led by maestro Kayane Simonian-Deryan. The event brought together hundreds of Aleppo-Armenians in the city’s Yesayan Hall. The keynote address was delivered by Krikor Doungian—a longtime leader in the Aleppo-Armenian community. During his address, Doungian congratulated the 25th anniversaries of the Republics of Armenia and Artsakh (Nagorno-Karabagh/NKR) and stressed the strength and importance of the Armenia-Artsakh-Diaspora trinity. “Yerevan, Stepanakert, Aleppo—they are all one for us… We are committed to all three,” said Doungian. Doungian then stressed the importance of Armenia’s role in helping the Armenian community of Syria during their time in need. “During these turbulent times, the Republic of Armenia stood by us [Syrian-Armenians]—diplomatically, in terms of humanitarian assistance, and by through civic opportunity—and you are all witnesses to this. Artsakh was by our side when an NKR Parliamentarian met with the community from this very stage a few months ago. 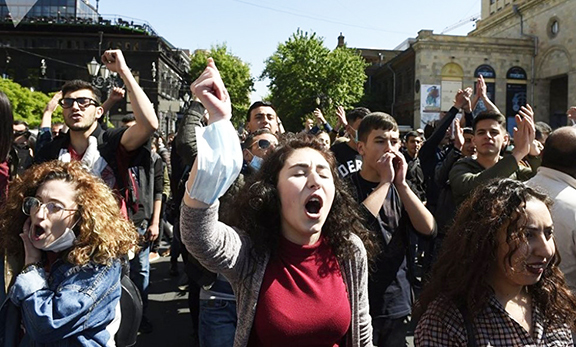 We were with Armenia and Artsakh during the [April] Four-Day War, by extending support, sending volunteers, and our ‘We are Artsakh’ campaign. This is the spirit of the ARF—the idea of a united Armenia and united Armenians—that allows our people to collectively overcome all trials, tribulations, and troubles,” he said. Following Doungian’s keynote address, Palig Arakelian (piano) and Manuel Ashekian (violin) of the Hamazkayin Parsegh Ganachian Music School performed an emotional rendition of “Aghpers u yes” (“My brother and I”). Following the performance Masters of Ceremonies Dzeroun Kahvejian and Sevan Ourishigian read congratulatory messages from several organizations and institutions. Archbishop Shahan Sarkisian then addressed the crowd, after which the event concluded with the signing of the ARF anthem. HALABIN. EM DIGINES HALEBZI A ANOUNE ANAHID A. Long live the Armenian community of Syria.